I'd been waiting for today for a couple weeks, at least, since I heard Barnes & Noble was rumored to be releasing a new nook e-reader. By the way, before I go on, I wish I knew the proper capitalization for the product. On their own site I've seen "Nook", "nook", and "NOOK". I wonder if they own the copyright to all versions. Anyway, the gadget. The gadget blogs seemed pretty split between it being another Nook Color, this time with the updated Android Honeycomb 3, or a new e-ink based design with a touch screen. I was hoping for the e-ink version, and my hopes have been fulfilled. 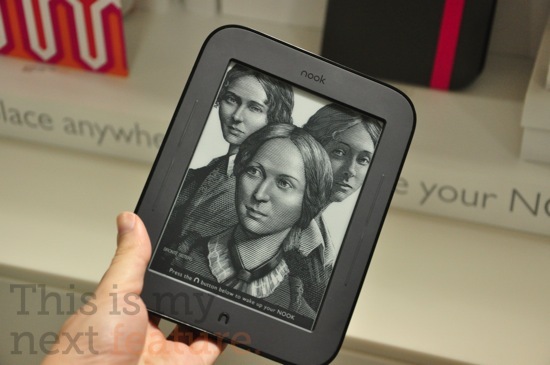 The new nook (Nook 2.0) is an E-Reader. Period. With this product they've drawn the line between their NOOK Color and nook; if you want bells and whistles with your E-Reader the Nook Color is for you, there are no bells, or whistles with the nook 2.0, and that's just fine with me. There's no games (which were horrible on nook 1.0 to begin with), there's no web browser (which was beyond horrible), and the MP3 player, which was a joke to begin with has been ditched. I'll be honest at first I was a little bummed about the lack of an MP3 player, but then I remembered that I had used the one on Nook 1.0 all of twice; once when I first got it to try it out, and once again to see if an update had made it any better. Besides I'll have a phone or iPod with music on me most of the time, so no real loss. Some will miss these "features", but they're available on a better product in the Nook Color. One feature that is gone from all NOOKs is 3G connectivity. On Nook 1.0 this meant being able to connect to the BN bookstore and purchasing new books when on the go, or download purchases previously made and stored in their library. Though the feature is nice, I found it to be not that useful. I won't miss this feature, but I'm sure some will. That's a lot of features lost on a new product, especially when new products are supposed to add more features. So what do we get? Android 2.1 is now running things, a giant step up from 1.6 on nook 1.0. But those of you looking to play some Angry Birds on this will be disappointed, no app installation. A new Pearl e-ink display that's supposed to be 50% better than what was in Nook 1.0. If you've seen a recent Kindle you've seen a Pearl display, and it is gorgeous. It was the only thing I liked on the Kindles. With the display we get faster page turns with less "flash", and not the Adobe type (cause that would be no Flash). Flash is the redrawing of the page on a page turn. Judging from video I've seen it's both faster and smoother. In keeping with social media, there are ways to share what you're reading on Facebook and Twitter, and what looks like a NOOK-centric social network where you can recommend books to other nook-ites. Sadly there's no Goodreads integration. The new non-replaceable battery is said to last 2 months on a charge, based on a half hour of reading per day with wifi turned off. It also keeps the same 2 gigabytes of on board storage that can be extended with microSD cards.Filed away in the "less is more" category we get a device that's 10% smaller, and an ounce or so lighter than the Kindle. My only knock against Nook 1.0 was weight, and this has been addressed. Oh, and the device is a touch screen! Yes, everything is a touch screen now-a-days, but I think this makes sense. I remember when first getting Nook 1.0 I initially tried to interact with it through the e-ink display, even though I knew I was supposed to use the LCD display. I'm actually a little skeptical about this as all you need to do is look at the screen of your touch device of choice; smudges. I am happy to find out that there are physical page turn buttons on the bezel though if you so choose. This screen works differently than your iDevice. It actually uses infrared light beams beamed over the surface of the display to register "taps". In theory you could operate it without touching the screen at all. Why is this a big deal? E-ink displays are known for their book like clarity and sharpness, adding a touch layer could degrade that quality making it not that much better than an LCD screen. You can read more about the tech over on Cnet. So, is it all double rainbows and puppy dogs? I'm not sure. I'm disappointed over the pricing, $139. When you look at the hardware taken out of the NOOK 1.0 (3G, headphone jack, touch screen LCD, user replaceable batteries) and some of the features taken out and look at what's been added I felt they could have done better than $139. Especially when you look at the pricing of the Kindle with ads at $114. $129 would have me seriously considering purchasing, and $119 would have me pre-ordering today. This isn't to say I'm not considering it, it just means I'm not running for my wallet. And what about Nook 1.0? It fell in price and starts at my magical $119 price point. BN is getting rid of them, and once they're gone that's it. If I were looking for a 1.0 device I'd keep my eye on eBay as BN is often times putting them up on special there, and I wouldn't be surprised to see them at $99. What does this mean for nook 1.0 users as far as updates are concerned? It would be my guess, since BN technically has devices running Android 1.6 (nook 1.0), 2.2 (NOOK Color), and 2.1 (Nook 2.0), that Nook 1.0s have seen their last update. So does that mean it's an automatic update? No. thankfully I'm still very happy with what my e-reader does, which is allow me to read e-books enjoyably, and no Android update will make it better by itself. Does that mean I'm not going to upgrade? I haven't decided yet, the new screen and size might be enough to make me pull the trigger. Opinions formed based on coverage by This Is My Next, ars technica, and cnet.